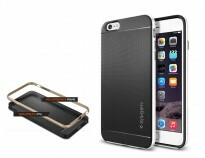 Spigen Crystal Hybrid is ideal for minimal enthusiasts that value maximum functionality! As mentioned in its name, the Crystal Hybrid is ideal in showing off your new iPhone 7 through its crystal clear TPU while also promising extraordinary protection with the combination of its dual-layered bumper protection. This particular iPhone 7/8 case design also adds convenience to viewing experiences because it embeds our best-selling magnetic kickstand that springs up in one easy flick. Our Crystal Hybrid includes everything you need in a phone case - protection, style and functionality!